Total export import turnover between Ho Chi Minh City and the European Union (EU) reached US$3.3 billion in the first seven months 2014, said the President of the European Commission Jose Manuel Barroso on Tuesday afternoon. Speaking at a meeting with HCMC People’s Committee Chairman Le Hoang Quan, Mr. Barroso said that the cooperation between HCMC and EU was well developing. At present, European business groups and companies open 233 representative offices and European investors are working in 833 projects in the city. Besides, the EU has nine Official Development Assistance projects with total capital of US$500 million. Three projects have come into operation. Chairman Quan hoped that Mr. Barroso’s visit to Vietnam will contribute in tightening the cooperation between the country and the EU. Earlier at a meeting in the morning in the city, European enterprises appreciated investment environment in Vietnam in general and in HCMC in paticular. 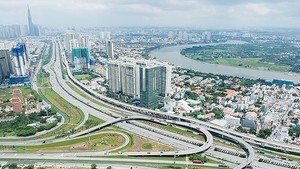 They expressed the belief that Vietnam continues to be a destination of European investors.